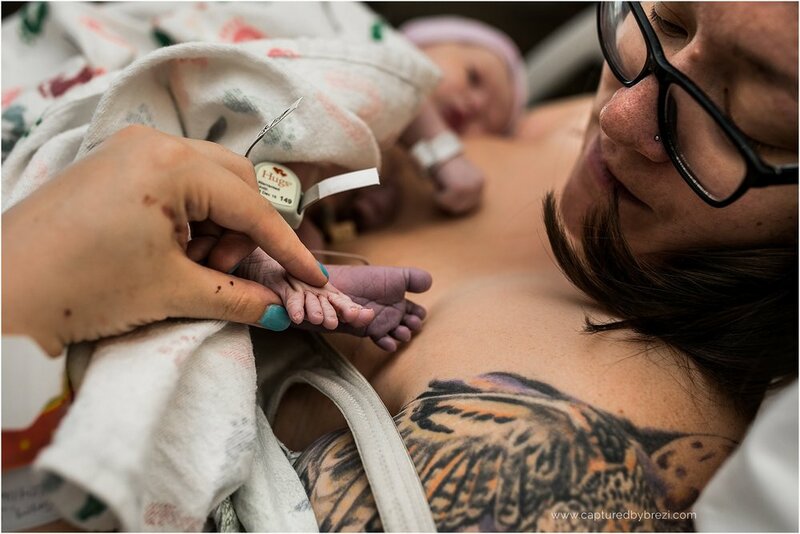 Birth of Stanley - Colorado Springs Birth Photographer — Love is Photography LLC. This was quite a special birth to me. I met Emily through her sister, Lauren, whom I went to highschool with. Emily and I bonded over the fact that we were both mama's of kids a similar age and all the woes and joys that comes with motherhood. Years of friendship pass, with talks about life and babies, and attendance of birthday parties for our littles too. Her friendship and support was there through my second pregnancy. We'd always chat about when her and Erin would find the right time to give their son Dexter a little brother or sister. I was so ecstatic to hear the news that she was pregnant again earlier this year, and that I would be able to be there to document that day. Her labor with Dexter had been very fast, so I was preparing for this labor to be much the same. And it was. I walked in the room to find that about 20-30 minutes later she would start pushing and be ready to have a baby before the doctor could prepare to catch.